Clusters of ornamental kale buds resemble roses. Purple veined crocus, yellow cupped winter aconite and pure white nodding snowdrops are just a few signs that spring is on its way. It's February in Vancouver, BC (growing Zone 8) and plants are beginning to stir. This is especially true this year since we've had such a balmy January. It's been a bit too mild as plants are growing, but it's only February for goodness sake. ​I don't know if Old Man Winter is done with us yet. Since it is February, it's time to sow some seeds in front of a sunny window and under grow lights. I hijack my kitchen counter as it is has a large south facing window. It's not very convenient for cooking, but it is convenient to have the little darlins’ in such a prominent place. I further augment the natural sunlight with grow lights. They certainly don’t suffer from neglect but that doesn’t mean I haven’t killed any in my time. Is it all worth it? I think so or I wouldn’t do it. It’s pretty cool growing your own plants. I’m going to try to tone it down this year, but I say that every year. A kitchen full of seedlings is difficult to work around and I miss my counter space. And let’s not forget, it’s only February; winter isn’t over yet. Wonder what’s in store? I’m crossing my fingers there’ll be no fury in our February. Hope there’s none in yours. If pruning your own plants seems a bit daunting, and you don't know where to start, Amanda will show you how in your own garden! Take the fear and uncertainty out of pruning your trees and shrubs. Your garden will thank you. For more information and to make an appointment click here. A dwarf Chinese witch hazel and winter heath flower in downtown Seattle. Winter aconite, Eranthis hyemalis, spring bulb, 6", plant in fall, sun to part shade. Zones 3 to 7. Snowdrop, Galanthus nivalis, spring bulb, 10", full sun to part shade. Plant in fall. Zones 3 to 7. 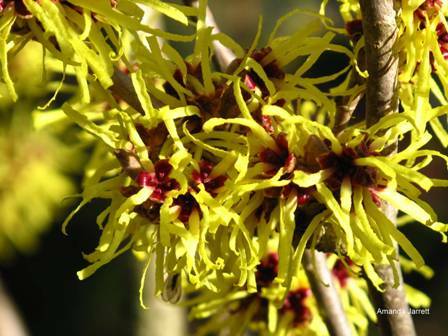 Chinese witch hazel, Hamamelis mollis, 10'-15', fragrant flowers Jan to March, sun to part shade. Zones 5 to 8. Japanese skimmia, Skimmia japonica, broadleaf evergreen, 3-4' x 4'-5', fragrant flowers, red berries on female plants, shade. Zones 6 to 8. 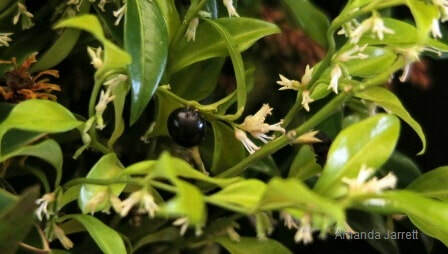 Himalayan sweetbox, Sarcococca confusa, broadleaf evergreen, 2-5' x 2-6', part shade to shade, fragrant flowers, black berries. Zones 6 to 8. Cotton Candy lenten rose, Helleborus x hybridus 'Cotton Candy', herbaceous evergreen perennial, 18" x 2', part shade to shade. Zones 4-8. Varietated winter daphne, Daphne odora 'Aureo-marginata', broadleaf evergreen, 3 - 4' x 2 - 4', part shade, fragrant. Zones 7 to 9. Corylopsis pauciflora, buttercup winter hazel, deciduous shrub, 4 -6', fragrant, full sun to part shade. Zones 6 to 8. 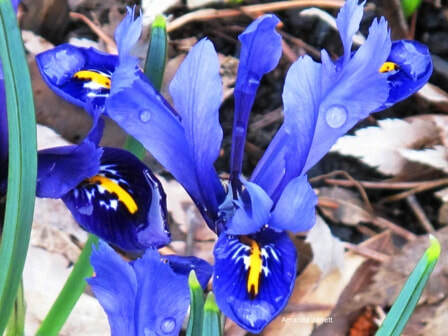 Dwarf iris, Iris reticulata, 3 to 5", sun to part shade, spring bulb planted in fall. Zones 5 to 8. 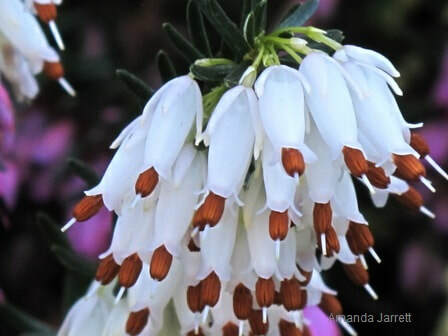 Winter heath, Erica carnea, broadleaf evergreen groundcover, 1 to 2', flowers Dec to April, sun to light shade. Zones 5 to 8. Winter aconite, Eranthis hyemalis, and crocus. This wee Japanese maple will never be the same again. There's a few things that are incorrect here. First, this dwarf weeping Japanese didn't need pruning. Secondly, it was pruned too severely and third, Japanese maples should be pruned in summer, not winter, to reduce the chance of diseases. ​They say practice makes perfect, and I have had oodles of practice starting seeds. I've quite a few failures, so much so that the Plant Police should arrest me for seedling cruelty. Through it all I have learned from my mistakes. That doesn’t mean that all my seedling live to a ripe old age, it means that most of them do. It is perfectly normal to lose a few to overwatering or underwatering, neglect, fungi or whatever along the way so don’t beat yourself up about it. For more detail on the process check out the Propagation section: Growing Seeds Indoors and click here. To find out when to start your seeds, look at the back of the seed packet. 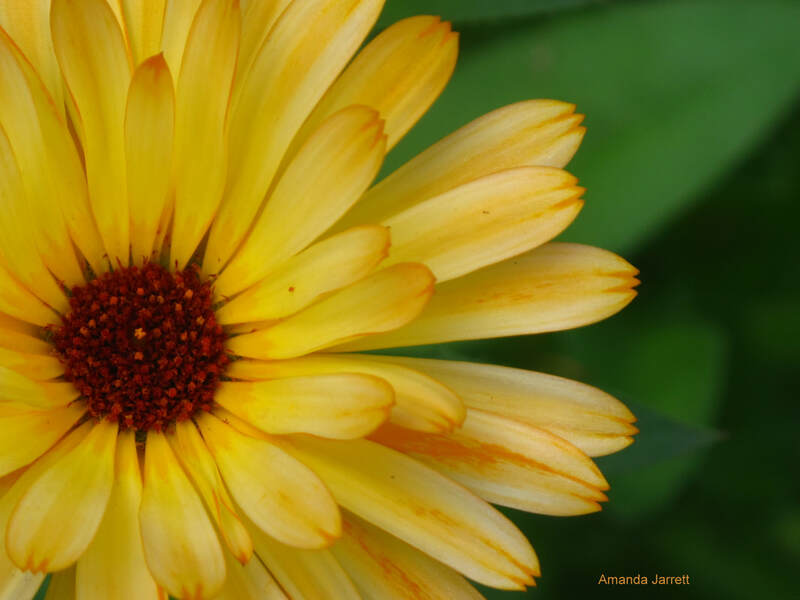 It’s full of info: when to plant, depth of seed, if they should be sown inside or outside etc. 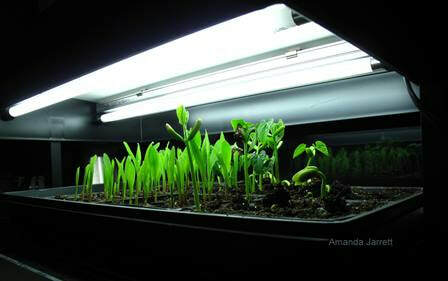 Provide adequate light: grow lights 2 to 4 inches above the seedlings. If seedlings are long and lanky, the light is too far away. It also helps to place them in front of your sunniest window. Provide adequate hours of light: 12 to 16 hours (use a timer). Provide bottom heat: place heating mats under the pots. They are available were seeds are sold. Leave them on 24/7. Use seed starting soil mix, not garden soil nor planter mix. Place drainage trays underneath the containers. Slightly moisten growing media with warm, clean water. Sow seeds thinly according to the instructions. Firm seeds into the soil. Water ever-so gently with warm, room temperature water. Don’t use cold as it promotes rotting. Keep evenly moist, not wet. Don’t allow soil to dry out as this kills germinating seeds. Use clear plastic or glass panes to cover seeds to prevent them from drying out. It must be removed once seeds germinate. If condensation develops remove the cover and replace when cover is dry. Once the cover is removed permanently, mist a couple of times a day with room temperature, diluted chamomile tea to reduce damping off. When seedlings outgrow their pots, transplant into individual pots and water gently. Avoid direct sun and grow lights for a few days until they perk up. Continue to take care for them indoors. You might have to transplant them a few times until they are ready to be planted outside. Harden them off before planting by taking them outside for an hour at first. Increase the duration, sun and wind until they are hardy enough to stay outside through the night. 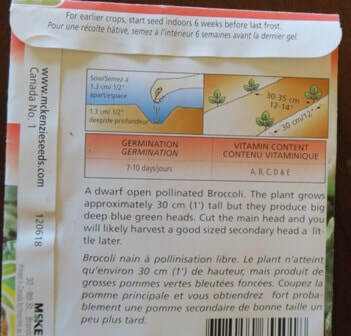 There's oodles of important information on the back of seed packets. For more information on how to set up your seed starting station check out Growing Seeds Indoors. 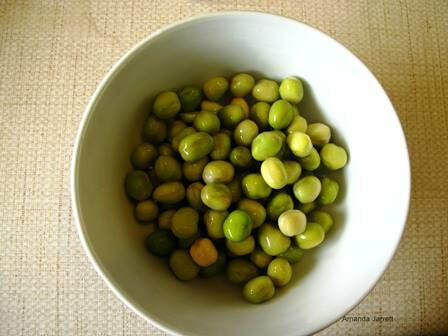 Soak pea seeds for a couple of hours until they plump up to hasten germination. Sow cool season crops when the conditions are right: a handful of soil shouldn’t drip water when squeezed and soil temperature is around 10 degrees Celsius (50 degrees F). Check seed packets when to plant and other pertinent instructions. Cool season crops include peas, celeriac, spinach, leeks, lettuce, cauliflower, onions, cabbage, kale and chard. (You can also start them inside if slugs and snails are a problem). For more information on sowing seeds outdoors (direct seeding) click here. 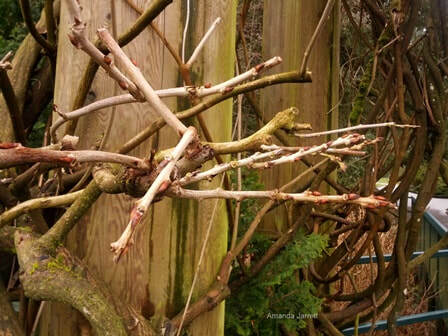 Prune all the side branches from wisteria vines to just a few buds to promote flowers and to tame them. 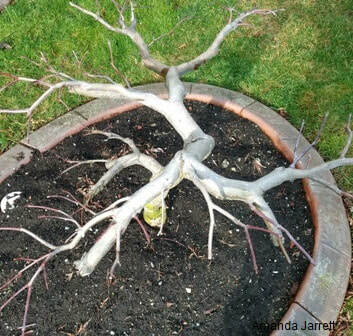 If your plants are still dormant and not sprouted new growth, then you have time to do some winter pruning. Pick a dry day. Note that winter pruning speeds up growth, while summer pruning slows growth, so if you want to tame an unruly plant, just take off obnoxious growth now. Do more substantial pruning in summer. Only remove ¼ of growth at each pruning. Plants, even mature trees, may not survive if too much is removed at one time. If in doubt when to prune, cut back plants only if they need it and so after they finish flowering. And if you want spring blossoms, don’t prune spring blooming plants now: forsythia, camellia, rhododendrons, azaleas etc. For more detail on Winter Pruning click ﻿here﻿. 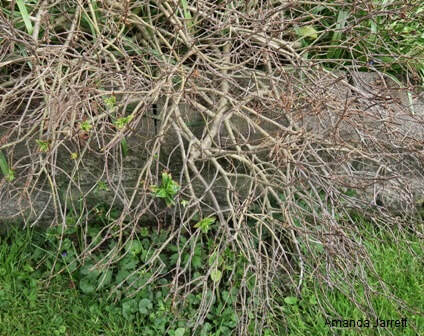 The following are some info on how to prune specific plants. Butterfly bush (Buddleia sp. ): Cut back stems to 6 to 18 inches in height. Vary the height of the branches to vary the flowering pattern. Wisteria: Prune all side shoots to 2 to 3 buds. Red twig dogwood shrubs: Replenish red stems by removing the old, non-red stems at their base. Prune summer and autumn flowering plants: Butterfly bush (Buddleia sp), Rose of Sharon, potentilla, crepe myrtle, hydrangeas, oak, linden, ash (Fraxinus). Broadleaf Evergreens: Prune holly, boxwood and mahonia in early spring before they put on new growth. Conifers (pines, spruce, firs etc. ): Very little, if any is needed, just remove errant branches. Don’t cut beyond the green portions of the branches. Avoid Bleeders: Don’t prune elms, maples, dogwoods, birches as they will ‘bleed’ sap. They are also more disease prone if they are pruned when dormant. Prune in summer. Apple & Pear Trees: Prune now while they are dormant. In summer prune Cherry, Apricot, Peach, Plum to prevent the spread of disease. Heather: Cut back winter heath (Erica carnea) once flowering has ceased. Avoid cutting back into the old, woody growth. Ornamental Grasses: Cut back ornamental grasses to the ground to make way for new growth. Don't prune birch, maples, elm and dogwood trees during the winter as they are prone to diseases. To stop weed seed from growing, apply corn gluten in February to April. Apply corn gluten to lawns this month and/or during March. This organic product kills germinating weed seeds and adds just a wee bit of nitrogen. Don’t apply to areas where you have sown grass or other desirable seeds as will kill them too. Apply again in autumn to kill seeds that sprout in fall such as chickweed and shepherd’s purse. It’s too early to apply a fertilizer, especially high nitrogen number (the first number is highest). Applying it now encourages new lush growth prone to frostbite. It also compromises root growth, which is an essential part of lawn health. Their roots are just starting to grow so plants aren’t able to keep up with the new push of leafy growth. Once the roots are long and strong, then apply a high nitrogen fertilizer in Mid April or May. This makes for a tough lawn that handles stressful times such as drought, flooding and heat. In the meantime, service the lawn mower; sharpen and clean mower blades. 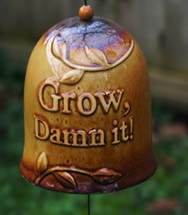 Oh and try to keep off frozen lawns as their growing point (crown) are easily broken off, which damages the grass plants. New sprouts indicate that tuberous begonias are ready for spring. ​Stored Tuberous Begonias: check on them to make sure they are intact and healthy. Discard rotten ones and water dry ones. If they have started to sprout, repot and add a slow release granular fertilizer, water and place in a sunny window. Don’t place outside until all the danger of frost has passed. The bigger the tubers, the bigger the flowers! Plant stored dahlia tubers in pots when they start to sprout. When dahlia tubers have sprouted, it is time to pot them up. This gives them a head start so they produce flowers earlier. It beats waiting to plant them outside in May. Divide large clumps by separating it into smaller clumps. Make sure each one has a growth bud or 'eyes'. Soak the stored tubers overnight before planting, especially if they are shriveled. Hopefully they will plump up if they are not too far gone. Discard any rotten ones or cut off any diseased parts off healthy tubers. Plant in pots using potting soil and label, with the eyes facing up. Cover with a 2 to 3 inches of soil and water. Keep them outside in a sunny, frost free area or a heated greenhouse. If it’s still freezing outside, place them inside a frost free, but cool location such as a garage or basement. Once their leaves poke out of the soil they'll need more light. Move them outside on frost free days or supplement their lighting with grow lights. You can keep them outside if there is a light frost, but do cover them with a frost blanket, sheet, tablecloth etc. Don't forget about them as they will need to be watered and monitored. Plant in the garden when the danger of frost has past. As soon as geraniums and other stored plants start to sport new growth its time to clean, trim and repot them. As soon as your stored plants sport new growth it’s time to get them ready for spring. Remove all the dead leaves, flowers etc. Remove spindly stems and cut back remaining stems by half. If the cut off stems have 4 nodes or more, make more plants with the cuttings. Remove debris from the soil surface and repot into one that’s one or two inches larger, no more. If you don’t want to repot into a larger pot, trim the roots by ¼ to ½ with a sharp clean knife. Use potting soil with a slow release granule plant food or add your own such as Osmocote. Water well and place in a sunny window, under grow lights so they don’t become spindly and weak. Place outside after the danger of frost has passed after you have hardened them off by gradually acclimatizing them to the outside. 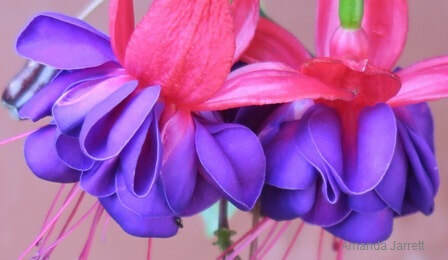 Fuchsias stored inside should be showing life this month or next month. 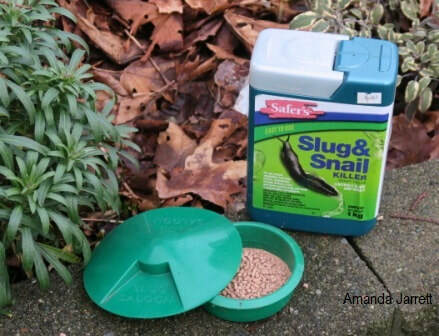 ​Slug Protection: Protect plants, especially primroses, from snails and slugs. To learn how click here. ​Kill Overwintering Insects & Diseases: Apply dormant oil & lime sulfur combo before leaves and flowers appear. Dormant oil kits are available at garden centers and home hardware stores. Read more. Frost Protection: As plants emerge from their winter sleep, freezing temperatures may injure tender plants such as camellias and dogwoods. Watch for severe frost, especially at night. Protect vulnerable plants with layers of burlap or other breathable fabric. 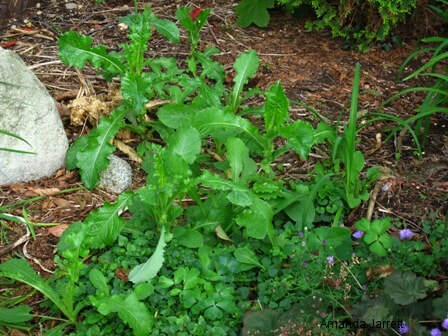 When weeds start to grow it means its time to plant cool crops and to weed! ​Clean Beds: When plants start to grow, remove spent foliage from iris, daisies, and other herbaceous perennials that have been left over the winter, especially if they are diseased (don’t add diseased plants to the compost). New Beds, Bigger Beds: Weather permitting, lay out and install new beds. Use garden hose to outline new beds or to increase the size of new beds. For new beds, there’s no need to dig up the grass with the lasagna sheet mulching method. To learn more click here. Prepare Beds: When soil isn’t dripping water when squeezed, weed garden beds and add an inch or two of compost then gently fork it in. When to Start Planting: Plant hardy cool season crops when weeds start to grow. Plant: Use pansies, primroses and other early flowering plants in garden beds and planters. Start Planting Early: Raised beds allow gardeners to start gardening earlier as they warm faster and drain better than traditional garden beds. 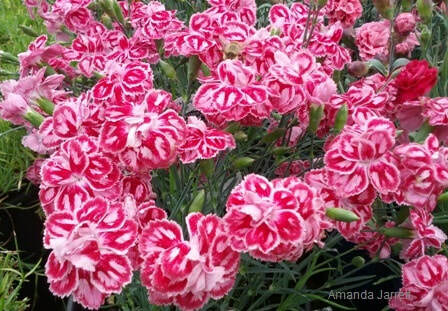 Divide summer and fall flowering perennials like this Starburst dianthus. ​Divide perennials: Select ones that bloom from mid-summer to fall in spring, preferably before new growth starts and when the soil isn’t dripping wet. This includes Astilbe sp., Rudbeckia (Black Eyed Susan), Monarda sp. (Bee Balm), Echinacea sp. (Cone Flower), Heuchera sp. (Coral Bells), Coreopsis sp. (Tickseed), Dianthus sp. (Pinks, Carnations) and ornamental grasses. Winter Pansies: Deadhead spent flowers and remove seed heads to prolong flowering. Cover Crops: Dig in cover crops (crimson clover or annual rye) this month or March, when soil isn’t dripping wet. Don’t remove them from the beds as you want them to decompose and replenish the soil. Potatoes: Start chitting early potatoes by standing them on end in an egg carton in a bright, cool and frost free location. Prepare potatoes by 'chitting'. Stand them upright so the will develop sprouts, 'eyes'. Weeds: Dig them up as they are vulnerable now and can’t fight back. For horsetail control click here. Kill Weed Seeds: Apply corn gluten meal (organic product that also contains nitrogen) to kill weed seeds in lawns and beds before they germinate. Don’t apply to areas where you have sown desirable seeds. Compost: Spur on the composting process by turning with a garden fork. Add water if it is too dry and if it’s too wet, added shredded newspaper or fall leaves if you have any remaining. ​Birdies: Clean bird feeders and top them up with fresh seed. Clean birdhouses and bird baths. 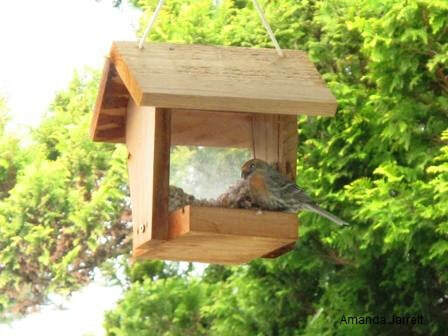 After winter, bird feeders, birdhouses and bird baths need a good cleaning. Lawn Mowers: Service, sharpen and clean blades. Lawns: Probably best to wait until March for aerating, liming and top dressing lawns with compost. The soil is generally too cold and too wet. It is certainly way too early to apply nitrogen. Clean Tools Etc. : Clean and disinfect used pots, drainage trays, label and all surfaces in the greenhouse. Clean all tools and sharpen where necessary. Drains: Avoid flooding by clearing the drains in and around your property. Icy Paths & Driveways: Refrain from using salt on paths as it injures lawns and plants, and contaminates soil. Use sand or a ‘green’ alternative that is non-toxic to plants, soil and animals. Plan: If you haven’t already done so, start planning veggie garden etc. 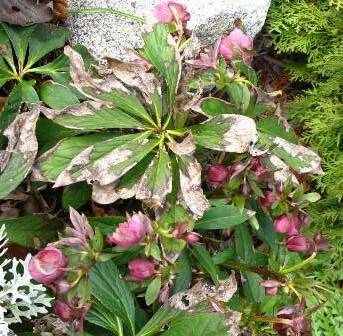 Hellebores, Lenten roses: Remove brown spotted diseased leaves from plants and discard. Hellebore leaf spot is spread by rain and wet conditions. Dark brown or black spots occur on both sides of the foliage and flowers. An effective way to control this disease is to remove infected foliage and other plant parts from the plant and the ground. 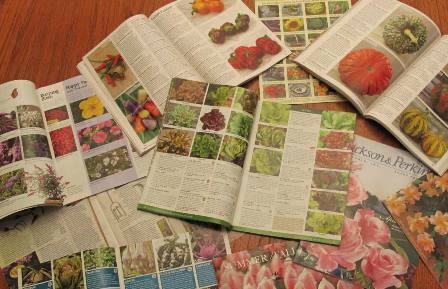 Plant and seed catalogues are great resources and a pleasant read. The following list includes a few of the companies I use, but there are many more out there on the World Wide Web. Click on the names below to link to view the following websites. 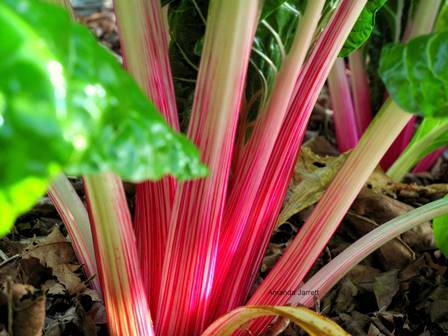 You can't find these attractive and tasty Swiss chard called Peppermint Stick in the grocery store, but they are very easy to grow from seed. It's Too Early for Spring! Is it still winter where you live? If you are still shoveling snow you probably think my garden chores for February are way out of line. I know there are many parts of the North America that are still in the throes of winter. Snow and below freezing temperatures are par for the course in February as well as March. ​Some tasks still apply like pruning, but wait to apply the dormant oil just before plants start to wake up and bud out. Spray when there is no rain, snow or frost predicted for 24 hours. Temperature should remain at 0°C (32°F) or above for at least 24 hours. Only apply to deciduous trees and shrubs, not evergreens. Apply in the morning so the plant will be dry by evening. Don’t apply if frost is predicated overnight. If in doubt for any garden chores, visit your local nursery for their advice. Spring bulbs, especially daffodils, are often dislodged when temperatures fluctuate. Warm days in the middle of winter are a rare treat and envied by those that are still suffering with frigid weather, however, it is not a good thing. ​Bask as we might on those rare but lovely balmy days the soil warms giving the plants a false promise of spring. As the soil warms it expands then it contracts when it cools. This expansion and contraction of the soil dislodging roots. Plant roots, including bulbs, become exposed to the elements struggle then die. Warm temperatures during winter will also initiate early flowering trees and shrubs to don their flowers too early, such as ornamental flowering cherries. That would be okay if below freezing temperatures would not be returning, but alas, winter isn’t quite over yet. As the winter progresses into spring temperature fluctuations are no longer an anomaly, they become par for the course. Generally, temperature swings aren’t as severe as winter, but that doesn’t mean damage is not done. I remember one March, a few years back, when temps dipped to below freezing and all the dogwood trees lost their flower buds. It was just for the one night, but that’s all it took. It was sad and our spring was not as floriferous. So why am I telling you all this? Although it is important to watch out for nighttime lows, also be aware of those daytime highs. Check the garden afterwards and firm plants and spring bulbs that have been dislodged. Adding a 3 inch layer of an organic mulch such as leaves is a great way to insulate the soil from temperature fluctuations and extremes. If you can’t add it now, do so in spring by purchasing bagged or bulk wood chips. The benefits of an organic mulch are many. To learn more click here. "It's alive! It's alive!" as Dr. Frankenstein would say. If you look closely, this seemingly dead hebe, has green sprouts emerging. ​Dead plants? We've still got a ways to go before winter is over so hold off hauling them out of the garden. There might be life left in them yet. The thermal heat of the earth keeps plant roots warm so while the top of a plant may show little or no signs of life, the plant may very well be alive. If they haven’t sported new growth by mid-March, then it is time to toss them. Chinese witch hazel (yellow spidery flowers), sweet box (white flowers), Pink Dawn viburnum (pink flowers), Japanese skimmia (big red berries), lily-of-the-valley shrub (drooping flower clusters), winter heath (white flowers), winter jasmine (yellow flowers), heavenly bamboo (clusters of small red berries). Shiny blue metallic berries, pink flower buds and deep green leaves of the laurustinus viburnum. Cultivars: V. tinus ‘Variegatum’ has variegated leaves. Comments: Very ornamental broadleaf evergreen shrub that looks great no matter what the season. This bushy shrub features deep green leaves, clusters of attractive pink and white fragrant flowers combined with iridescence blue berries. A great addition for winter garden as it flowers when little else does. It's also salt and drought tolerant, deer resistant and attracts bees, butterflies and other pollinators.